Pelvic trauma can lead to severe, uncontrollable haemorrhage and death related to prolonged shock and multiple organ failure. Massive retroperitoneal haematoma should be assumed to be present in cases of post-traumatic haemodynamic instability associated with pelvic fracture in the absence of extrapelvic haemorrhagic lesions. This review describes the pathophysiology of retroperitoneal haematoma in trauma patient with blunt pelvic fracture, considering the roles of venous and arterial bleeding. Efficacy and safety of haemostatic procedures are also discussed, and particular attention is given to the efficacy of pelvic angiographic embolization and external pelvic fixation. A decision making algorithm is proposed for the treatment of trauma patients with pelvic fracture that takes haemodynamic status and associated lesions into account. The initial management of patients presenting with pelvic fracture and haemodynamic instability remains difficult. An early evaluation of severity is essential in these patients, many of whom have suffered multiple trauma. The immediate risk to life is linked to the possible occurrence of refractory haemorrhagic shock, with the associated major coagulation disorders. The main problem is linking bleeding to a retroperitoneal lesion that is accessible for arterial embolization, as early as possible. Retroperitoneal haematoma should be assumed in cases of post-traumatic haemodynamic instability associated with pelvic fracture in the absence of extrapelvic haemorrhagic lesions. When possible, thoracic-abdominal-pelvic computed tomography (CT) scanning with contrast should be used to screen for arterial lesions. Rigorous management as part of a decisional algorithm aimed at achieving haemostasis as rapidly as possible is indispensable. The respective roles of angiographic embolization and pelvic ring fixation in this algorithm remain subject to debate and controversy. This clinical review focuses on the initial management of patients with blunt pelvic trauma and haemodynamic instability. The Medline database was searched for English language medical literature published since 1980, with specific attention given to recent, clinically relevant publications. The specific objectives of this review were to describe the pathophysiology of haemorrhage in pelvic fractures as well as efficient therapeutic options to control retroperitoneal bleeding. Where there is insufficient evidence, we describe our opinion based on clinical experience. Most pelvic fractures result from motor vehicle accidents, but severe complex pelvic fractures may also result from falls from buildings . The pelvic ring is much more solid than many other bone structures, and high-energy trauma is required to disrupt this complex. Consequently, these fractures are rarely found in isolation, and patients with pelvic fractures often have multiple trauma. The seriousness of pelvic fractures lies in the possible occurrence of retroperitoneal haematomas and haemorrhagic shock . The pelvic ring is anatomically connected to a large number of blood vessels (Figure 1). The internal iliac (or hypogastric) artery originates in the sacro-iliac joint and gives rise to the superior and inferior gluteal arteries. The external iliac artery follows an oblique path, in front of the arcuate line. The venous system follows a pattern similar to that of the arterial system, but in a more posterior position. In older series, haemorrhage was the main cause of death (two-thirds of cases) in patients presenting with pelvic fracture . Mortality rates of 40% to 80% have been recorded in patients with major haemodynamic instability [4, 5]. Recent progress in resuscitation, medical, surgical and endovascular techniques has made it possible to decrease the overall mortality rate, which nonetheless remains at about 20% [5, 6]. Anatomical description of main pelvic arteries and veins. There are many classifications of pelvic fractures, which are based on the mechanism underlying the lesions or the posterior instability of the pelvic ring. Tile and Pennal [7, 8] described three types of underlying mechanism: type 1 (antero-posterior compression), with transverse opening of the pelvic ring (open book) and risk for internal iliac artery lesions; type 2 (lateral compression), with risk for iliac vessel and retropubic plexus vein lesions; and type 3 (vertical instability), with posterior structural lesions of the pelvic ring. The risk for haemorrhage depends on the type of lesion . Type 3 fractures are the most haemorrhagic, followed by type 1 and finally type 2 fractures. Unstable fractures (displacement of more than 0.5 cm) are much more haemorrhagic than stable fractures . The classification developed by Burgess and Young , from that of Pennal and Tile , also accurately predicts risk for haemorrhage. This classification includes an additional category corresponding to mixed lesions, which are associated with high risk for haemorrhage. Retroperitoneal haematomas in patients with pelvic fracture are secondary to the vascular and/or bone lesions that may cause massive haemorrhagic syndrome. Vascular lesions are more frequently venous (90%; mostly lesions of the presacral or prevesical veins) than arterial (10%; trunk or distal lesions) . However, arterial lesions are more frequent in cases of haemodynamic instability . Traumatic vascular damage is frequently bilateral. Clinical experience is that bleeding of venous origin may stop spontaneously if the local venous pressure and the pressure of the retroperitoneal space equalize. However, in cases of pelvic fracture, the retroperitoneal diffusion space is profoundly modified; the retroperitoneal space may indeed cease to be 'closed'. Grimm and coworkers  showed that, for a given pressure, four times more liquid could be injected into the retroperitoneal space following an 'open book' type fracture than in the absence of fracture. This increase in injectable volume probably reflects diffusion beyond the retroperitoneal space. The volume of the retroperitoneal space may thus reach up to 4 l. This is of particular importance for treatment, because the theoretical efficacy of pelvic ring fixation is based on the principle that the retroperitoneal space is closed or can be closed by fixation of the pelvic ring. Similarly, exploratory laparotomy performed for associated abdominal lesions may trigger the re-expansion of a retroperitoneal venous haematoma, by simple decompression. The referral of patients to hospital departments specializing in the treatment of cases of multiple trauma is essential, as is access to a high-performance medical and technical platform. This platform must provide round the clock access to interventional radiology, with as little delay as possible. The early management of the patient, from arrival in the shock treatment room, is designed to facilitate the detection of emergency situations that require immediate intervention. An antero-posterior chest radiograph should be carried out to check for gaseous or liquid pleural discharge that requires drainage. A radiograph of the cervical spine, in profile, should also be taken to check for traumatic medullar lesions that could potentially be the cause of haemodynamic instability. An antero-posterior radiograph of the pelvic ring should be done to detect fractures and possible displacement. In addition, FAST (focused assessment with sonography for trauma) ultrasound should be used to detect free intraperitoneal effusion. Note, however, that this examination is not sensitive enough for reliable detection of retroperitoneal haematoma. 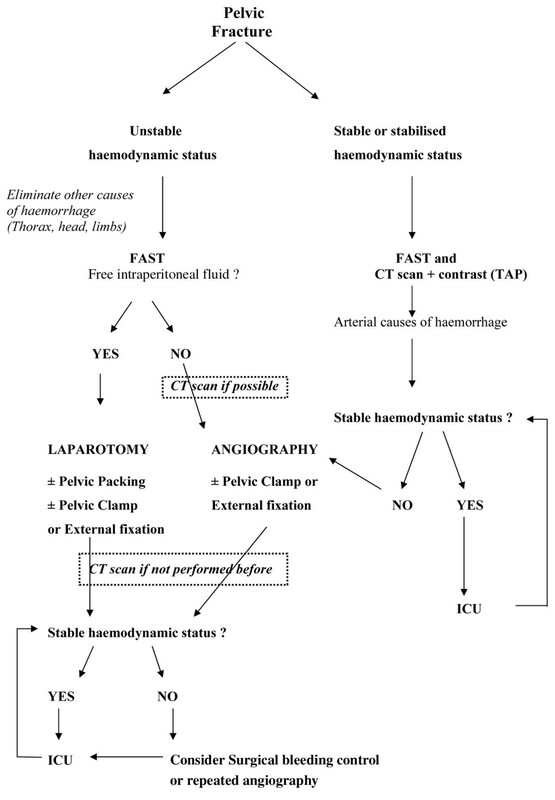 Once these examinations have been conducted in the shock treatment room, any post-traumatic haemodynamic instability associated with a pelvic fracture in the absence of an extrapelvic haemorrhagic lesion should be attributed to a retroperitoneal haematoma. This diagnosis should lead to efforts to stabilize the haemorrhagic lesions as rapidly as possible. It is also useful to rule out long-bone fractures as a cause of the haemorrhagic syndrome. The resuscitation of patients presenting with pelvic fractures focuses, of course, on the control of haemorrhagic shock, before any attempt is made to correct hypovolaemia (filling with crystalloids or colloids, or transfusion with blood cell packs). It also involves correction of haemostatic problems secondary to coagulation disorders associated with dilution or consumption of coagulation factors (corrected by transfusion with frozen plasma and platelets). Early stabilization of the pelvic ring appears to be an effective method to reduce haemorrhage. Circumferential wrapping with a sheet or belt encircling the hips at the level of the greater trochanters is an effective method for fixing the pelvic ring and reducing bleeding of venous origin [14, 15]. This contention is simple, inexpensive and can be used before admission to hospital by crossing the sheet across the symphysis, pulling it firmly and clamping it at four points . This method is recommended in the Advanced Trauma Life Support guidelines of the American College of Surgeons . A pelvic circumferential compression device has also been developed, and was demonstrated to be effective in reducing open book type fractures without any complications [18, 19]. A pressure suit (or anti-G combination), first used by the American military, is another means of achieving haemostasis, particularly before hospital admission. Such suits have not been demonstrated to decrease mortality among patients with multiple trauma (based on a Cochrane library review ), but they do seem to have a potentially useful haemostatic effect in cases of retroperitoneal haematoma. They appear to compress pelvic fractures, decreasing blood flow through the vessels below the diaphragm. They also appear to decrease the area of vascular breaches and have a haemodynamic effect, increasing venous return. The counter-pressure created by the use of pressure suits may therefore compromise tissue perfusion pressure, particularly in case of low arterial pressure. The usual contraindication is the association of pelvic injury with trauma above the diaphragm (severe thoracic trauma). Pressure suits should be deflated gradually and with caution. In some cases, such deflation can only be carried out in the operating theatre or angiography room. These external pelvic interventions can only provide a temporary solution in serious situations, buying doctors time to carry out haemostatic treatment (arterial embolization or surgery). All of these first-line interventions for external contention and temporary stabilization of the patient should be replaced by fixed stabilization techniques as early as possible. Three surgical interventions to achieve haemostasis are possible: use of fixation devices, surgical exploration of the vessels, and damage control surgery. Fixation devices can be used to immobilize pelvic fractures in emergency conditions to achieve haemostasis rather than for bone reconstruction or fracture reduction. They are theoretically effective for bleeding of venous origin, but not for arterial bleeding. The anterior part of the pelvic ring can be fixed with an external fixation device, by implanting pins in the crest of the coccyx bone, behind the anterior superior iliac spine and above the roof of the acetabulum, between the anterior superior and anterior inferior iliac spines. Such fixation can limit the size of a retroperitoneal haematoma, particularly in cases of venous bleeding, by restoring an appropriate pressure-volume relation. In most trauma centres, this intervention requires the transfer of the patient to the operating theatre for at least 30 to 45 min. Unstable posterior pelvic ring disruptions can be reduced and compressed using a C clamp. This type of clamp was initially described by Ganz and coworkers  as a manned antishock clamp. Such clamps can only be used temporarily, but they are easy to implant in emergency conditions by inserting two percutaneous pins into the coccyx bone and the sacro-iliac joint. This antishock clamp exerts transverse compression on the sacro-iliac joint. It effectively decreases venous bleeding and leads to haemodynamic stabilization if there are no arterial lesions . This clamp can be positioned rapidly (about 15 min) without transfer to the operating theatre. Furthermore, the tightening frame can be mobilized around the fixed axis, leaving the abdomen free for laparotomy. One must be aware of the possibility of nerve lesions and of perforation of the pelvic organs, particularly in cases of comminutive fractures of the sacrum, which render the use of a pelvic clamp dangerous . This device may be indicated in case of unstable posterior pelvic ring disruptions (or sacro-iliac joint diastases) with important bleeding . Surgical exploration of the vessels, checking for haemorrhagic lesions, necessitates retroperitoneal access. It has been demonstrated that accidental opening of the posterior peritoneum during laparotomy can convert partially controlled haemoperitoneum to uncontrolled haemorrhage. Surgical ligature of the internal iliac arteries has been proposed but has not been demonstrated to be effective . Such surgical exploration in injured patients with haemodynamically unstable pelvic fractures is associated with high mortality rates (66% to 83%) and so it does not appear to be an appropriate treatment . Occlusion of the aorta (with an endoluminal balloon or by clamping) could be used temporarily, to save the patient's life in extreme circumstances, making surgical haemostasis or transport to angiographic room possible . Damage control surgery (packing of the pelvis with parietal closure) can be used to restore haemostasis while waiting for arterial embolization to take place . This approach seems to be very effective for both venous and arterial bleeding . The surgical drapes used for packing are removed or changed during a second intervention 24 or 48 hours later. The efficacy of this technique has not been evaluated in a large series of patients. However, it may be of value in cases in which the pelvic trauma is associated with abdominal bleeding requiring laparotomy. Damage control surgery would therefore appear to be useful in cases of severe haemorrhagic syndrome of multiple (intraperitoneal and retroperitoneal) origin . Recently, retroperitoneal packing has been described as a resuscitation technique for haemodynamically unstable patients with pelvic fracture . The effectiveness of direct retroperitoneal packing (without laparotomy) was described in two cases of adult patients with major pelvic bleeding, presumably from venous origin. A midline incision of the lower abdomen is performed, leaving the peritoneum intact, and the presacral and parvesical region is packed. Similar efficacy was also reported in one paediatric case of major pelvic trauma . Nevertheless, as the authors specified, further studies are needed to validate this technique . Arterial embolization requires specialized teams to be both present and available. Treatment options should not be limited by lack of access to an appropriate medical and technical platform, and it is therefore vital to refer patients to trauma centres at which angiography can be carried out. The patient must be transferred to an angiography room for arterial embolization. Every effort should be made to facilitate the transfer, monitoring and treatment of these patients in angiography rooms. Pelvic arterial embolization requires arterial access, frequently via an arterial introducer (4 or 5 Fr), positioned via the femoral route on the side contralateral to the suspected fracture and haemorrhagic vascular lesion. Tomodensitometry should be performed if the haemodynamic status is stable or stabilized, to localize arterial bleeding, and to guide the rapid and selective catheterization of arteries that are likely to be damaged. Embolization is sequential. The first angiogram is performed in the common iliac artery of the presumed traumatic/haemorrhagic side. During angiography one looks for signs of macrovascular lesions, based on extravasation of contrast product (false aneurysms), missing arteries and arteries with wall irregularities, or arterial or venous stagnation of contrast product. 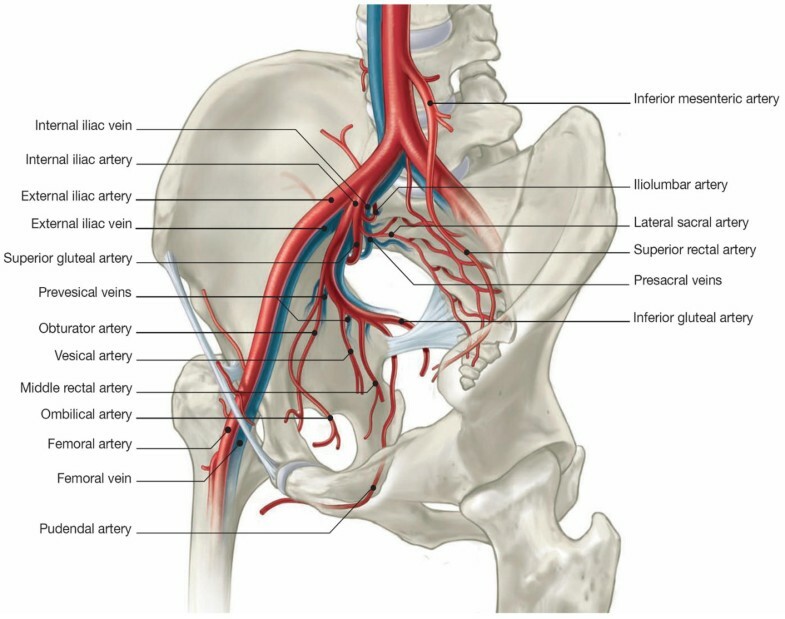 The arteries most frequently involved in haemorrhages associated with pelvic fractures are (in descending order of frequency) superior gluteal, lateral sacral, iliolumbar, obturator, vesical and inferior gluteal. The aim of embolization is to achieve immediate vascular occlusion (often temporarily) by decreasing pressure upstream from the leak; this facilitates physiological haemostasis, thrombus formation and healing of the dissected vessels. The vascular occlusion agents of choice are uncalibrated agents, particularly gelfoam (Curaspon®, Curamedical B. V. Holding, Zwanenburg, The Netherlands), with a limited lifetime (7 to 21 days), which can be cut into fragments according to the size of the artery. Other agents, including coils and fluid agents (glues of the histoacryl type), can be used to achieve permanent occlusion and are often suitable for more highly targeted arterial haemostasis, such as false aneurysm. The selectivity of catheterization and the type of occlusion agents depends, on one hand, on the type of lesion and its accessibility; on the other hand, it depends on the need for procedures to be short, which is a necessary constraint in the management of these patients with multiple trauma. In cases of major haemodynamic instability that persist despite failure to identify any arterial lesion, nonselective, bilateral embolization of the internal iliac arteries with Curaspon® may be necessary . Indeed, temporary spasm of the bleeding artery may mask angiographic signs of bleeding. At the end of the procedure, angiography can be used to check that the embolized territories are correctly occluded and to ensure that there is no apparent bleeding from collateral or other arteries. However, the efficacy of embolization is better attested to by rapid improvement in haemodynamic status in the angiography room than by angiographic criteria. Arterial embolization appears to be the treatment of choice for pelvic fractures complicated by arterial haemorrhage. Success rates for arterial embolization (as assessed on the basis of haemodynamic criteria) for pelvic fractures with haemodynamic instability are generally 80% to 100% . In a prospective study, Velmahos and coworkers  recently reported success rates of almost 95%, with a total intrahospital mortality rate of about 14% in 80 patients undergoing embolization for pelvic fractures for haemodynamic instability or for fractures associated with risk for bleeding. Table 1 summarizes the principal recent studies that addressed the efficacy of pelvic arterial embolization for pelvic fractures [6, 31–36]. Fewer than 5% of pelvic embolization patients suffer complications. Most of these complications are simply haematomas at the site of arterial puncture, which is necessarily prevented by correction of coagulation disorders before ablation of the introducer and by prolonged compression after its ablation. Cases of dissection, thrombosis and arterial spasms have been reported in association with vascular puncture. Pelvic embolization may also be complicated by gluteal muscle necrosis [37, 38], skin necrosis, necrosis of the vesical wall  or of the femoral head , sensitivity problems , or dissemination of the embolism . Nonselective bilateral embolization does not seem to be associated with greater complications (gluteal muscle and skin necrosis or urogenital complications in men). Ramirez and coworkers  found no increase in urogenital complications among patients with pelvic trauma who underwent embolization of the two internal iliac arteries. However, it is often difficult to distinguish between the trauma itself and the consequences of embolization. In patients with pelvic fracture, haemodynamic instability could be defined as systolic blood pressure below 90 mmHg despite administration of 2000 ml crystalloids or 2 units packed red blood cells . For these patients, opinion remains divided as to whether surgical fixation of the pelvic ring should be carried out before embolization or vice versa [45, 46]. We prefer arterial embolization first in cases of haemodynamic instability associated with pelvic fracture. Recent prospective studies have shown that 44% to 76% of these patients have arterial lesions [6, 32, 44, 47–50]. One study  showed that almost half of all patients with pelvic fractures likely to benefit from use of an external fixation device probably did not obtain the expected benefit because of the presence of at least one arterial lesion; the implantation of the external fixation device may well have retarded therapeutic embolization in these cases. A recent retrospective study performed in our university hospital of patients presenting with pelvic fractures complicated by haemorrhagic shock (requiring more than 4 units of blood during the first 24 hours) demonstrated the efficacy of a protocol combining haemodynamic optimization and early, first-line pelvic arterial embolization (not preceded by pelvic ring fixation) . Angiography showed that more than 75% of arterial lesions were accessible to endovascular treatment and that embolization was successful (according to angiographic criteria) in 96% of cases. In addition, embolization was followed by haemodynamic improvements in 84% of patients. It should be stressed that, following initially effective arterial embolization, a second angiography may be required if transfusion yield remains insufficient. Gourlay and coworkers  showed that about 7.5% of patients who initially underwent embolization for a pelvic fracture underwent a second angiography, which revealed active bleeding in about 80% of cases (68% at a new haemorrhagic site, 18% at the initially embolized site, and 14% at both). Two independent risk factors for recurrent arterial haemorrhage have been identified: transfusion with more than 2 blood units per hour before the initial arterial embolization and more than two arteries initially embolized. Shapiro and coworkers  identified three independent risk factors for the recurrence of bleeding requiring further arterial embolization: systolic arterial pressure below 90 mmHg after embolization, acidosis (base deficit >10 mEq/l) persisting for more than 6 hours after initial embolization, and absence of intra-abdominal haemorrhagic lesions. The risk for recurrent arterial bleeding in patients with all three of these factors was 97%, whereas it was only 9% in the absence of these factors. Direct retroperitoneal packing should also be considered in the case of persistent haemodynamic instability in patients who underwent angiographic embolization. In this case, control of venous bleeding may be helpful to decrease the duration of shock . Note that arterial embolization and external fixation of the pelvic ring are not antagonistic, and each can easily be followed by the other. Nonetheless, in cases of haemodynamic instability in the absence of intra-abdominal lesions, the priority should be haemostasis of a probable arterial lesion, and angiography should therefore be carried out urgently. In cases of haemodynamic instability with intra-abdominal discharge, it is sometimes difficult to differentiate between haemoperitoneum originating from an intra-abdominal lesion and haemoperitoneum 'diffusing' from a massive retroperitoneal haematoma. In cases in which exploratory laparotomy is urgently required, the pre-surgical implantation of a pelvic fixation device may be beneficial, making it possible to stabilize pelvic lesions. In cases of haemorrhagic hepatic or splenic injuries associated with pelvic trauma, angiography should be discussed considering the option of embolization without need for laparotomy for complete treatment of these multifocal arterial haemorrhagic sites. In haemodynamically stable patients and in stabilized patients, whole-body CT scanning should be performed. Miller and coworkers  studied the efficacy of CT scans with injection of contrast medium for screening for arterial lesions in patients presenting with pelvic fractures stabilized by initial treatment. They found that extravasation of the contrast product had a sensitivity of 60% and a specificity of 92% for the diagnosis of arterial lesions. Other recent studies [52–54] have reported sensitivities of 80% to 84% and specificities of 85% to 98% for this examination. There appears to be no indication for arterial embolization in cases of haemodynamic stability. Tomodensitometric screening for vascular lesions can be used to optimize close surveillance in the intensive care unit and to guide secondary embolization in cases of haemodynamic deterioration. In stable patients, the indication for external fixation is not linked to haemorrhage but instead is a surgical decision (reduction of an unstable fracture before internal fixation, for example). Miller and coworkers  proposed a decision-making algorithm for management of bleeding pelvic fracture. Because application of institutional practice guidelines may reduce mortality rate and transfusion requirements in pelvic trauma patients , we propose our institutional algorithm, based on existing literature and personal clinical experience (Figure 2). Institutional decision-making algorithm for initial management of blunt pelvic trauma patients. CT, computed tomodensitometry; FAST, focused assessment with sonography for trauma; ICU, intensive care unit; TAP, thoracic-abdominal-pelvic. The modern therapeutic management of patients with serious pelvic fractures is based largely on techniques for rapidly stopping bleeding. In haemodynamically unstable patients, the frequency of pelvic bleeding of arterial origin is high, and angiography with arterial embolization is therefore the treatment of choice. If haemodynamic conditions permit, embolization should be preceded by whole-body CT scans, making it possible to screen for extrapelvic arterial injury, to localize the pelvic bleeding and to guide embolization to facilitate the rapid, selective catheterization of the arteries most likely to be damaged. Arterial embolization can be carried out immediately, or as a secondary treatment, in cases of persistent or recurrent bleeding with haemodynamic instability. Pelvic fixation devices, which are thought to facilitate venous haemostasis, could be used as a complement to arterial embolization. In cases of haemorrhagic abdominal lesions associated with pelvic venous bleeding resulting in a major retroperitoneal haematoma, exploratory laparotomy may aggravate retroperitoneal bleeding by a simple decompression effect. Damage control surgery (pelvic packing) and pelvic clamps are effective treatment options in such cases. The failure of a given haemostatic technique should not be considered definitive, and should prompt new discussions considering all possible solutions (further arterial embolization and/or surgical fixation and/or retroperitoneal packing). Collaborative, multidisciplinary management (critical care physicians, surgeons and radiologists) is therefore indispensable for the optimization of treatment. In memoriam: Alain R. Edouard (MD, PhD). The authors wish to thank Mr Philippe Payet for drawing the illustration presented in Figure 1.